Touch2Heal Osteopathic Clinics were established in 1991 by Cecile Kiener. Please click on the menu above or visit our home page to discover more about osteopathy and the wide range of conditions we treat. Cecile Kiener qualified from the European School of Osteopathy (ESO) in Maidstone, Kent. Cecile practices both structural and cranial osteopathy in Ashford and is a fully qualified acupuncturist and affiliate to Zita West. To find out more about Cecile and our other practitioners please click on the About Touch2Heal link. Osteopathy is not just suitable for treating back pain as many believe. In fact it’s ideal treatment for a wide range of conditions – such as joint pain, tension headaches, pregnancy pains and digestion issues. At Touch2Heal our osteopaths take a caring holistic approach to your treatment. They treat not only your symptoms but you as a whole. Click to find out how osteopathy can help you. 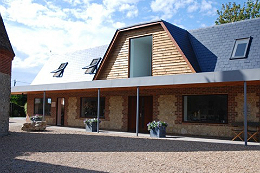 Our Ashford Osteopathic Clinic is situated in a beautiful rural location on the outskirts of Ashford. Evegate Business Park is host to a number of delightful shops and services and is an ideal place to stop for a bite to eat. The site hosts ample free parking and the clinic itself provides for disabled parking and wheelchair access. To find out more about our clinic, location and fees please click on the Ashford Osteopathic Clinic link. Our practitioners run regular osteopathy and acupuncture clinics in Ashford, Kent. To book an appointment at our Ashford Osteopathic Clinic please call 07725 837356, online using the link on the home page or email us at enquiries@touch2heal.co.uk. Alternatively you can use our contact form by clicking on Contact Us. I always had a lot of back pain which my GP said was arthritis. The medicines were of no help. I eventually went to see Cecile who had doubts about the arthritis. She sent me for x-rays which turned out normal. She suspected fibromyalgia and this was later confirmed. The treatment Cecile is now giving me is far more effective. My sciatica was so bad I could barely walk. I even had injections but they didn’t work. My GP suggested trying Touch2Heal as he had other patients who swore by them. Sharron felt confident she could treat me and she was right. I immediately felt better and after three sessions I could hardly feel the pain at all. She said I should consider Pilates. I’ve been doing this for 18 months now and I have no more problems. If you have morning sickness go straight to Cecile. She is a miracle worker. The difference she made to me was incredible. My knees had become a real problem for me these past few years so I started seeing Sharron in Ashford. Since she started treating me the improvement I feel is wonderful. She showed me some exercises as well to strengthen my leg muscles and I walk everyday. It’s the best I’ve felt in years.